This entry was posted in My Musings, Retirement and tagged boomer lifestyle, gusto, New Year's resolutions, retirement, risk, unexpected gifts, women's inspiration, wordle by justabackpackandarollie. Bookmark the permalink. Love the Wordle, Nancy! Some great words in there 🙂 …and I’m glad you’re going for it – I’m sure you won’t be sorry! Rock on! Thanks Lois. I love the process and the visual reminder. I’m working on a mandala and a vision board. They all help me sort through the clutter and then it’s up to me to actually take action. I’m definitely a work in progress. Hope you are well. Let’s catch up for tea/coffee soon. I came over to from our Everyday Magic class and love your word for the year. Congratulations on taking a risk and inviting all of us to follow along. I would love to start a blog. Perhaps I should begin by adding Tammy’s writing course too. Sandy, Thank you so much for clicking over. I really love the Everyday Magic class. It is exactly how I want to experience life these days. I’m thinking of taking Tammy’s writing class we well. She is an inspiration. I’m loving everyone’s photos. We are all so different. How cool is that? 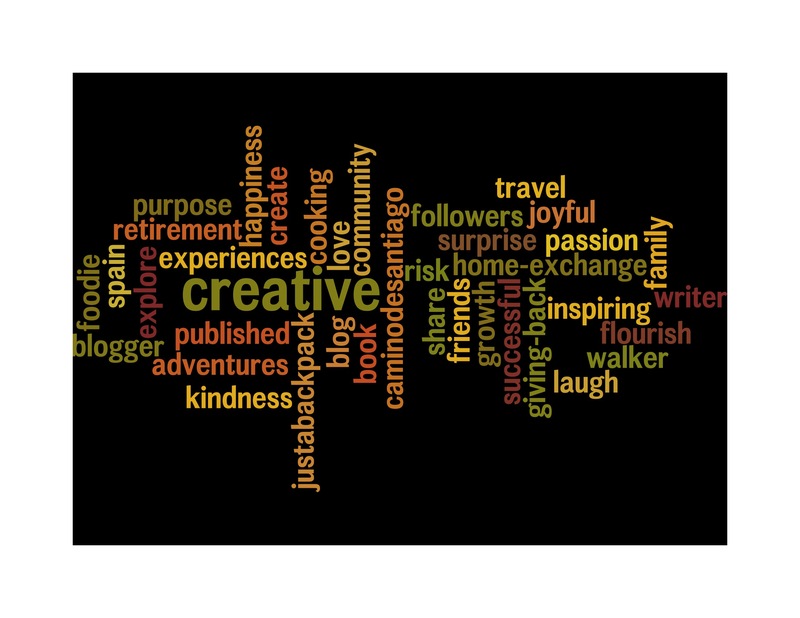 I often need to map it out or write it out or slow down and imagine it in my mind before taking any big step… so I love the Wordle, a great idea. I may have to do that for my year before January is done…thanks for the idea! Hi Lora, Thanks for stopping by and for leaving a comment. I truly appreciate it when readers share their thoughts and feedback. I agree that it’s hard to get where you want to be without some sort of a map. Wordle is fun!